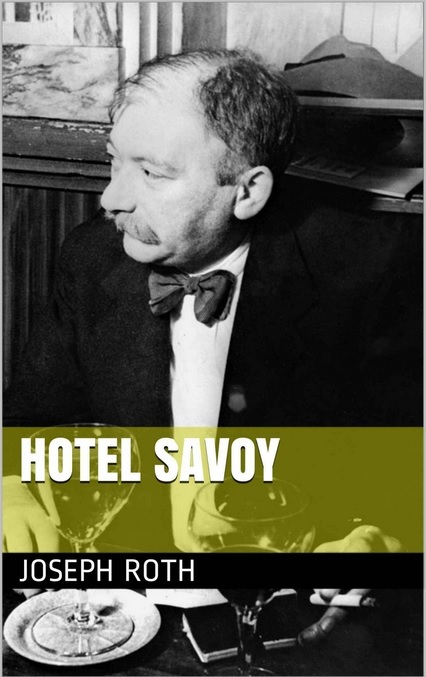 I started to read Joseph Roth’s Hotel Savoy for the 1924 Club but ran out of time to post a review. The book really appealed to me as it was set in a hotel and there’s an endless parade of quirky, sometimes grotesque, characters, and yet I found that I didn’t really enjoy it; it seemed a bit of a trivial book. And then I looked at it the other day, which is only a week or so after I had finished it, started reading it again and enjoyed it the second time through. I think the main problem was that I was rushing through it and as it’s a book with a fast-paced narrative most of it just wasn’t sinking in. Note to self: to enjoy reading I have to take it slow. Published in 1924 it’s an early work by Roth. The main character is Gabriel Dan, a soldier returning home from a Russian concentration camp after World War I. He’s ended up at the Hotel Savoy in an unnamed city in Eastern Europe (Wikipedia states that it’s Łódź, Poland), his ultimate aims are unclear but he’s currently just looking forward to some running water, a clean bed and soap. I am thankful once again to strip off an old life, as I so often have during these years. I look back upon a soldier, a murderer, a man almost murdered, a man resurrected, a prisoner, a wanderer. He has one of the cheap rooms on the sixth floor. The hotel is quite luxurious but the occupants of the hotel are a mix of the wealthy and the poor – Gabriel mixes mostly with the poor. There is a strike going on at one of the factories and there is talk of revolution in the air, especially with the influx of soldiers returning from Russia. Gabriel is scarred by his experiences of the war and finds it difficult to reconnect with humanity. I am alone. My heart beats only for myself. The strikers mean nothing to me. I have nothing in common with the mob, nor with individuals. I am a cold person. In the war I did not feel I was part of my company. We all lay in the same mud and waited for the same death. But I could think only about my own life and death. I would step over corpses and it oftened saddened me that I could feel no pain. Gabriel quickly settles into the rhythm of the hotel even if he constantly feels like he should be moving on. We’re introduced to a whole load of characters in the first half of the book, there’s the girl, Stasia, in the room above who paces about during the night, there’s Gabriel’s rich uncle Phöbus who’s reluctant to part with any money, there’s Phöbus’s son Alexander who is attracted to Stasia, as is Gabriel. There is also Santschin, an elderly clown, whose act involves a donkey, Hirsch Fisch who dreams of winning lottery numbers and sells them to customers, and there’s Ignatz the elderly lift-boy who always seems to be watching what people are getting up to. There are rumours about the Greek owner, Kaleguropulos, turning up for an inspection though no-one ever actually sees him and there are rumours that a child of the town, Bloomfield – a millionaire who now lives in the U.S., will be visiting soon. And there are many more characters that we get to know via short pencil-sketches of their more entertaining traits. He is a healthy person. I envy him. In our part of the world, in the Leopoldstadt, there were no such healthy fellows. He enjoys the vulgar things of life. He has no respect for women. He knows no books, reads no newspaper. He does not know what goes on in the world. But he is my loyal friend. He shares his money with me and would share his life with me. And I would do as much for him. So, with Zwonimir things pick up. Bloomfield arrives and both Zwonimir and Gabriel ingratiate themselves into his life for a while. It’s certainly strange that I didn’t like this book on my first read as it’s just the type of book that I find entertaining. The book is quite bleak, in a way, but has plenty of humour, loads of weirdly interesting characters and a climactic ending. If I wanted to be critical then I would say that the narrative style clips along a little too quickly and the book may have been better if Roth had expanded certain bits and slowed down. But it is what it is, and in the end I thoroughly enjoyed it. I may read it again in another week’s time. Great review! Sounds like the type of book I would love. I think you’d like it Melissa…it’s also a short book and quite cheap to buy (on a kindle at least). Glad you finally got to this one! I liked it a lot, but I take your point about the pace – that could well have been a slight issue. However, I liked the way he captured the sense of post-war dislocation and the effects of the ever-shifting European borders. I’m glad I’ve got a Roth ‘under my belt’ for GLM. I was initially going to read a lot more Roth & Zweig this year but haven’t read too many. I may also read The String of Pearls. I think what I learnt from my experience with this book is that there’s no sense in pushing myself to read something when the time’s not right. Exactly right – you can’t force reading. I have a copy of MM but I’ll really have to be in the right mood for that one, I feel. I’ve chosen shorter books this year for GLM as I’m not into long novels at the moment. Roth is an author I have not read yet though he has been coming up a lot in relation to other reading I have done this year. There definitely are times that are not right for a reader and a book to meet. I also kept seeing his name pop up all the time but he’s easy to overlook for some reason. When I found out he wrote ‘The Legend of the Holy Drinker’ (a favourite film of mine) I really paid attention. I’m trying to read more Roth & Zweig. An excellent companion to this work is the just published collection of Roth Essays, Hotel Days Wandering Between the Wars, edited and translated by Michael Hoffman, your companion movie is Grand Hotel. I enjoyed recalling this book which I like a lot through your very well done post. I have seen Grand Hotel Budapest and enjoyed it – I just recently watched Moonrise Kingdom as well. I read your review of the Roth essays and I can see why that one would go well with Hotel Savoy. The Vienna Tales collection I reviewed yesterday contains three very short pieces by Roth – they’re brief sketches, snapshots of life so to speak, but very effective. I really like the sound of Hotel Savoy so it’s going on my wishlist. The hotel setting definitely appeals to me (I loved Wes Anderson’s Grand Budapest Hotel). Thanks for the link. I’ll read the article later. I haven’t read ‘Radetzky March’ yet as others appealed to me more. RM sounds as if it’s almost a 19th century novel. I think it forms a trilogy of novels. Your reading experience with this book is interesting. I think like many of us I have come to new appreciation of books years after my initial reading. I agree that rushing through a work can really ruin it. Of course any reread is likely to open up new vistas. The sounds really good. The characters and situations seem like the stuff of good books. When I was reading it the first time I was thinking to myself, ‘I’m not really enjoying this book but I should enjoy it as it’s the sort of book I like’. I have, of course, returned to unliked books and liked them on the second read but there was usually a larger time period between reads. I like how you’ve summarised Hotel Savoy. Back in July I reviewed this book on my site (I didn’t know about GLM then); it just happened to be a work that a bookseller in Vienna recommended to me when I wanted some German to read – not too long and not too deep. Thanks bookheathen. I had intended to read many more Roth & Zweig books this year but it hasn’t quite worked out that way. I think I probably first heard of Roth from one of the earlier GLMs. I’ll check out your review ASAP. One of the few Joseph Roth works I haven’t read yet; so far he never disappointed me and I will try this one as well one day. Just finished a small collection of his journalistic works and these small pieces are just as good as his novels. An amazing author! Yes, I’m planning on reading a lot more Roth….and Zweig.